I love making ice cream. It’s one of those things that looks hard until you try it. 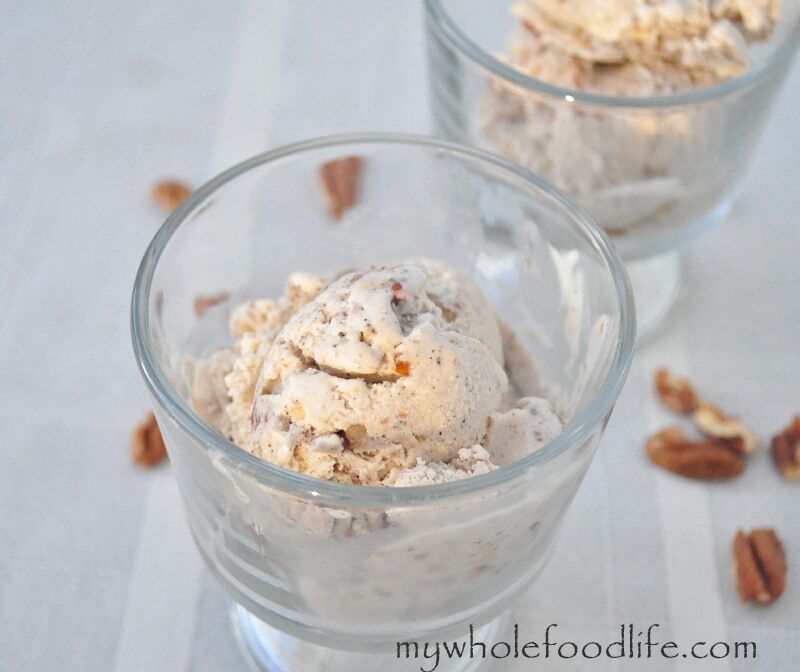 This pecan and caramel ice cream might be one of the best ice creams I have ever made. 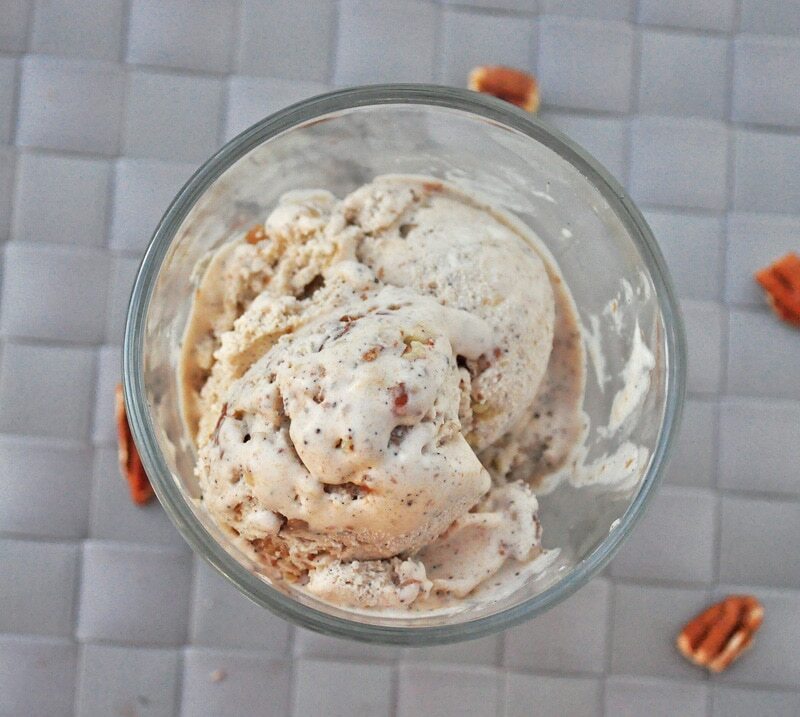 This stuff is good… I really can’t say enough about this pecan caramel ice cream recipe. You are probably wondering how I made a vegan caramel. Dates can make an incredible caramel if you just blend them with a little water. I love that I can make a caramel with zero added sugar. I also added very little sugar to the ice cream mixture itself. This recipe is like my 3 ingredient Peanut Butter Ice Cream. Just a few simple ingredients is all you need. In a blender or food processor , blend up the ingredients for the caramel. In the ice cream machine , add the ingredients for the ice cream, except the pecans and turn on the machine. After about 5 minutes, drizzle the caramel mixture into the ice cream bowl. When the ice cream looks like it’s almost done, add in the nuts. The whole thing took about 15-20 minutes to make. I got about 4 1/2 cup servings out of my batch. Enjoy! It's like you are in my head - you know exactly what I want to eat!! This sounds delicious - and I love the idea of using dates for caramel. So smart! Thanks Gretchen! I hope you enjoy the recipe. Do you think you could double the recipe to use in a 1 1/2 quart ice cream maker? I have a larger family so I would need to double the recipe. I was considering a 1 1/2 quart and a 2 quart machine. I can't double the recipe in the machine I have. I tried once and it overflowed everywhere. If I were you, I would get the bigger machine. I am definitely going to give this a try. I hope you enjoy it. Dates make such a great caramel. First, this looks amazing. It's my absolute favorite ice cream flavor, too. Second, I have a question about the ground vanilla bean. They sell it at our local Williams-Sonoma and I was planning to buy it to make your favorite granola recipe. But then, I read the reviews for it online and the reviews were either "It has absolutely no flavor or fragrance -I'm very disappointed" or "I absolutely love it. I use it all the time." So, I'm curious....does it really not have flavor or fragrance or are those people just expecting the strong flavor/fragrance of artificial liquid vanilla? Thanks! I love the ground vanilla bean. I think it smells amazing and also packs a strong vanilla flavor. I still use extract in a lot of recipes, but I love using the beans in ice cream recipes. You can always get a vanilla bean and scrape the seeds out too. This looks great! Except it isn't vegan if there's honey in it. :) Though most vegans will know to substitute the honey for something else, it can be deceiving for someone wanting to prepare this for a vegan. Thanks for catching that! I usually put raw honey and maple syrup and I guess I forgot on that one. :) The post has been edited. I'm not sure how to make ice cream in the Vitamix. Maybe you can check their website for an answer? Sorry I can't help more. The vitamix makes ice cream when you have the proper ratio of frozen ingredients to liquids. You should try freezing the coconut milk in ice trays first then adding the frozen coconut milk cubes and the other ice cream ingredients to the vitamix. Just don't blend it too long or it will turn it back to a liquid. When you see four mounds form at the top of the mixture it is done. for the caramel mixture. Do you chop the dates or blend them to make the caramel? Sorry a little confused. Looking forward to making this. I blend them into a caramel. Do you have to use an ice cream maker? It works best in an ice cream maker with very little effort. You can try blending it and then pouring the mixture into ice cube trays. Once it's frozen, you can put the cubes back in the blender and blend them back up. I haven't tried it, but it may work that way. thanks for the great recipe! I can't wait to try it :) I read in another post that use me medjool dates because they're bigger so if I were to use California dates what do you think would be the right proportion? 1:1.5? To cut the calories, could I use almond milk instead of the coconut milk? You can, but it will be far less creamy and even a bit icy tasting. I have tried. What would replace the sugars in this recipe? (both dates and maple)? in order to get a diabetic friendly recipe?